Hello everyone! Remember my led tetris game? Well, i was thinking to expand it a little... into a coffee table. My I idea is to split the 2' x 2' top of the table into 16 x 16 squares. My idea is to to have squares that have something hot on (like a cup of coffee) glow red. However, I'm not sure how would I go about this heat sensing. From what I've heard before, an IR diode (sensor) can be used to sense heat, in that case, how close will I have to have the IR diodes? Can I have them under glassplexiglass? Will they sense hand's warmth too? Or is there a better alternative? My idea so far is to have 1 RGB Led, and 1 IR diode in each block of the table top. A lot of us have announced our real names in one of the other forums... I am one of the Daves here but since there is only one Mongo, that seems to work better for confusion sake. There are IR sensors that are active in the lower thermal ranges like body heat and cooking temperatures. These are the ones you would find in an alarm system that detects temperature differential to detect a presence. It sounds like you might be using quite a few for this project and it could get pricey. Hm.. well, i found this interesting sale on ebay - 20 IR "receivers" for $3. that's not bad at all. However, will they be sensitive enough? I don't think they are sensitive enough @ 700-1050 nanometer with body temperature being 12 micrometers! It all has to do with your "net" philosophy. This can and has/will made/make some very deep discussions on different forums. "Most people" (remembering of course that generalizations are usually erroneous) do not think about it. Some do not think about it but appreciate it when they see someone use their name. Some people are so scared of losing their privacy they would not dare to think of "using" their name, and in fact will even criticize others for revealing such personal information. The forum administrators usually set the precedence for signing post in a forum. Humberto and Mike always sign their post. Like I said you would be amazed how deep this question can go. The changing times are reflected, would you send a personal correspondence without signing your name. There are people now who have never sent or received a letter but they post their thoughts on the Internet. Personally I am not Ralphxyz, I just use that because Ralph is usually taken on most forums. I want to take responsibility for what I say so I "usually" sign any post with my name. There are/can be a lot of issues concerning signing your name. In fact one could ask are you signing your name and what does it matter if you are or aren't. Hm... I can't seem to find 12um sensors at all :\ Would they be called 12um IR receivers? I am playing with a Sharp 2D120X, using the tempsensor ADC code. If I put my drink (5" vodka and water) over the sensor and then put my hand over the glass there is a change in the ADC output. So I believe they would work under glass or plexi. Thanks, lol nice workbench setup there ;) lol I guess i'll get those diodes and experiment with them. Thanks. The Sharp 2D120X, are really very sensitive. I was thinking about using them for area sensing for a balance bot. I will try to incorporate them into a RC car, they easily could be used for a line following robot. I was also thinking about using them for button less input on a Alarm Clock project. In order to quiet the alarm I pictured just passing my hand over the sensor so it would be a contactless button response. There should not be any switch bounce. I am using the Nerdkits tempsensor project so a ADC value > 300 will mean the same thing as a switch closure. Glass and plexiglas block body heat radiation. 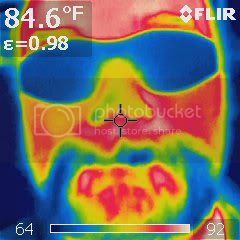 Two of my avatars are FLIR pictures of my face with clear plastic safety glasses on. Makes my eyes look like alien eyes. IR sensing is one of my side projects that I have done some research into but not done much hardware work yet. Anyhow, long winded story cut short, if you decide to go the IR route in the future, the "cheap" IR motion sensors meant for using passive IR to sense people or other large heated objects will be the cheapest route by far. If you do some looking and digging you might be able to find some cheaper versions of the same thing. I got a couple individual PIR diodes for $3 a piece of electronics goldmine a few weeks back but haven't had a chance to play with them yet. Also, the IR transmission spectrum is kinda wierd for various materials and spectrums. I could be wrong, but I vaguely recall something like in the near visual spectrum most glass and plexiglass are 80+% transmission ranges, though obviously "low E" versions will be much lower for IR. As usual, Ralph has a good idea. Assuming the output LED has enough power to get the beam through the glass and back it should work well for you. I had a QTR-1RC which has a <3.5 cm sensing range and it didn't have enough power to sense through only an 1/8 of pyrex with 90% transmission in that frequency. So you might want to keep any object-glass-sensor distances to bare minumums. In case you wanted to know, to get a true 12ym IR photodiode you need to use some of the "exotic" diodes (InGaAs, GaInAsSb, GaAlAsSb) and they are not cheap at all. I wasn't looking in the 12ym range but rather the 7-9ym range (ideal for doing CO2 gas analysis)and the cheapest photodiode for that ranges was just under $200 a piece, minimum order of 50. So definately not an option for my budget. If you feel like looking into fancy IR photodiodes, Thor labs is an interesting place to start with lots of info on various IR diodes and such. Mongo and 6ofhalfdozen, yea I saw a mythbusters show about blocking body heat with a piece of glass. However what about this "Sharp 2D120X" - it's simply a pair of IR receiver and IR transmitter. They work of a different frequency then body heat, will that go through glass? Maybe. 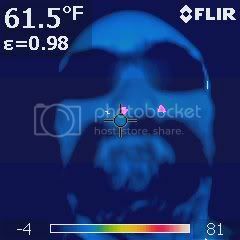 The reason FLIR works is that the lens is not either glass nor plastic. It's actually a metal called galena. The sensor also does not use plastic nor glass to cover the sensitive element. I am not sure what that is but it works. Body heat is outside the optical IR, so I don't know how it might be detected. Stan, I did a further experiment using a clear plastic container top. With the plastic resting on the sensor there was very little difference from clear air. definitely were detected you could also paste a white bottom to your coffee cups. In fact you could have different colors to have different values for different pieces. Darn now you got me thinking about scoring games, probable not needed for your Tetris game but I am sure there are games that use different valued pieces like Chess. You could do a table top Chess game or similar with colors (reflection values) for the piece value. I got my Sharp GP2D120 IR Sensor from Hobby Engineering. I also got the three pin wire harness to match. This forum application sure does not like links to .MOV files. Here is the link to Hobby Engineering. Hi Stan, yeah and it also went through thick glass and water to detect when I placed my hand over the glass so I am sure you will come up with something. I'll try to do some color test to see what colors I can detect. I know white and black give different ADC values. It will be interesting to see what red, blue, yellow and green produce for ADC readout. I might have to incorporate bretm's ADC stabilizer code from my jumpy ADC. I can easily picture a Chess board or maybe someone will come up with a new game with value pieces. One problem is $13.99 for the unit but I wonder if I could not do the same with some Radio Shack IR diodes/detectors. I originally bought them because I want to make up a buttonless alarm clock. They probable are overkill for something like that but what do I know? Well, that unit has 30kHz (or 40, not sure) modulation built into transmitter, and demodulation - into receiver. That pretty much cancels almost all of the noise. So I just bought 100 IR LEDs and 100 IR receivers for $25 total. Will do modulation in software more likely, or perhaps I can find some neat circuit for that. Oh, if you are just doing simple tests like that, why not to use your oscilloscope? I'm pretty sure it's more precise then NerdKit's ADC.